The Paper Pumpkin kits are getting better and better. I had a great time with this month's Paper Pumpkin kit. It's called Picnic Paradise and is so cute. There are three different sets of mini cards to create as well as four cute picnic baskets. The colors are bold and bright, just the way I like it. 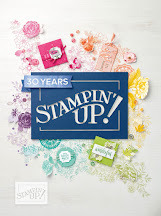 Labels: Paper Pumpkin, Stampin' Up!